Ambassador of the Hellenic Republic to the U.S.A.
From July 1998 until July 2000 he directed the cabinet of the European Union Coordinator for the Royaumont Process for Stability and Good Neighborliness in South East Europe and, subsequently, the Chairman of the Working Table on Democratization and Human Rights of the Stability Pact for South East Europe. In March 2010 he was transferred to the Embassy of Greece in Ankara as Minister-Counselor and Deputy Head of Mission. From April until December 2012, he was heading the Embassy as Charge d' Affaires a.i. In January 2013, he assumed duties as Ambassador, Head of the Liaison Office of the Hellenic Republic in Skopje. 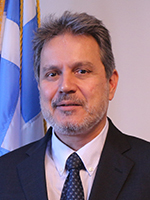 In June 2016, he became the Ambassador of the Hellenic Republic to the U.S.A.
Mr. Lalacos is married to Anna Michalopoulou. They have two children, Errikos and Myrto, 26 and 24 years old respectively. Besides Greek Mr. Lalacos speaks English and French. He is also conversant in Spanish and Italian.